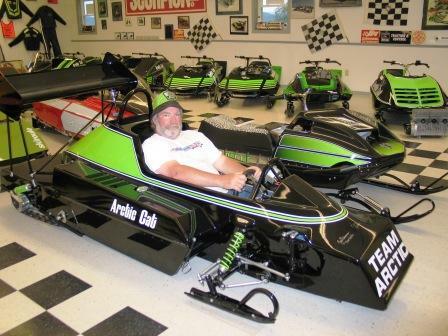 Vintage snowmobile collector Jerry McGee is going to pare down the size of his amazing collection, and he’s starting with his Arctic Cats. 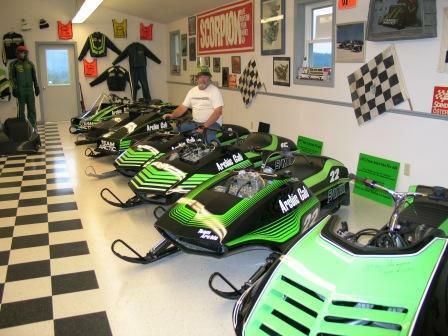 If you were looking to land some of the most-rare and classic race sleds in Arctic Cat history, now’s your chance. McGee (who's pictured in both images) lives in Whitefield, N.H., and he’s been collecting sleds for nearly two decades. -1976 Arctic Cat 440 Sno Pro (according to Jerry, most people believe this was Larry Coltom’s original 250, but is currently fitted a 440 engine). -1977.5 Sno Pro 440 with the mid-season addition of IFS front suspension (according to Jerry, this was Larry Coltom’s sled). -1980 Sno Pro 340 Built from NOS parts that Steve Olsen acquired after Arctic Enterprises auction. It has used crank and track, and everything else is NOS. -1981 Sno Pro 340. This is believed to be Jim Dimmerman’s race sled, although there is uncertainty about it. It does have a serial #/VIN tag, however, no other '81 that he's seen has a VIN tag to compare with (including Bob Elsner’s sled at the SHOF). -1981 Twin Track prototype (below). This machine is one of the handful of various twin-trackers built by Roger Gage at Arctic Enterprises, but never raced. It was restored by Steve Olsen, with finishing touches performed by McGee. McGee is handling all sales privately. If you’re interested in any of these, shoot him an email by clicking HERE. I think that twin-track sled is just what I need for the 2011 WOBLE ride to Waconia. If you buy and bring it to WOBLE, I will award you with a very special prize. The airfoil is ideally suited to WOBLE-like speeds. At least you wouldnt have to take on a passenger when someone breaks down Charlie! The 73' EXT behind the twin track gets my heart bangin'! I thought there was only one or two of those twin tracks. That must be a recent purchase for McGee. I sure hope one of them makes it to Catfest. HONEY!!! I just picked up a new mailbox for the house. OK!! Would it be better for these collections to remain in private hands or would it be better if Arctic Cat started scooping them up? "I wish I was a billionaire so, (edit bad word) bad....."
Glad to see this sled restored. I designed and built this sled in my spare time when I worked at Team Arctic. There only was one built and the only person that ever drove it other than myself was Jimmy Dimmerman. It was a little hard to stear with the small steering wheel but went around the corner like it was on a rail. Its weight kept it from being competitive so we never raced it. Of the 5 Twin tracks I built, this one was the only one that realy worked as planned. do you still have any sleds for sale? do u still have sleds 4 sale?retired and looking 4 a project ! did cross country racing in 70's. on Cats but really wanted 2race ovals luv the Z's and sno pros! looks like u do too!any help or leads to find 75-80 sleds would help me.am sure u get alot of emails but a am serious.plaese send pics and prices and any other info u might have. i live in central Minnesota,the home of "The Cat". Jerry still has a few machines including a couple that he won't likely part with but I was fortunate enough to look at his current collection in NH just last week... I would be proud to own any one of them...! I would like a chance to bid on a sno pro sled. Its been my dream to have one. Do you still have any sled (sno pro) for sale? I am interested. Not sure this is the place to put this but I just noticed that Allen is reegsterid for the Yukon Quest next year.Will Aliy hold back her team for the Iditarod or will Allen get to use a couple of the Red Team dogs?Or, does SP Kennel have enough dogs to run the Yukon with a team that will not be used in the Iditarod? How much for the ‘76 440 Sno Pro?